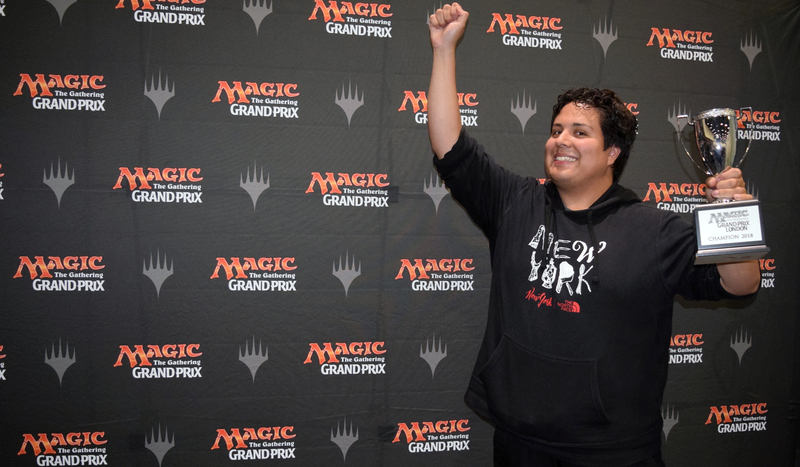 Mexico's Marcelino Freeman placed first of 1,979 in Rivals of Ixalan Limited, using Pirates to outmaneuver (21) Steve Rubin's Raptors in the finals! THE HASHTAG FOR GRAND PRIX LONDON IS #GPLONDON. JOIN THE CONVERSATION. With 1,979 competitors, Grand Prix London was by far the largest event of the weekend, and a number of big stories came out of it. To begin with, a lot of big names entered it. With Pro Tour Rivals of Ixalan coming up next week, many of the world's top players made a stop in London, England, on their way to Bilbao, Spain. All in all, sixty Gold and Platinum pros made use of the opportunity to test Rivals of Ixalan Limited in a real tournament setting, and they certainly made their presence felt here in London. (22) Andrea Mengucci, (12) Brad Nelson, and (21) Steve Rubin all finished the first day 9-0, and the latter two later joined (1) Seth Manfield in the Top 8. In the end, however, it was Mexico's Silver pro Marcelino Freeman who took on all comers, including three pros from the United States. First, he dispatched Gold player Mark Jacobson in the quarterfinals, then he took down the world's No. 1 Seth Manfield in the semifinals, and finally he defeated 21st-ranked Steve Rubin in two quick games the finals. Congratulations to Marcelino Freeman, champion of Grand Prix London 2018! A whopping 1,979 players entered the tournament in total, including an almost unrivaled 60 Gold and Platinum pros. After eight rounds of Rivals of Ixalan Sealed Deck, 415 qualified for the second day, and after nine rounds, eight players left the venue with perfect records, a pristine 9-0: (21) Steve Rubin, (12) Brad Nelson, Raul Avila, Jonas Nieke, Filippo Maurri, (22) Andrea Mengucci, Philipp Krieger, and David Jensen. That's a Pro Tour champion, a former Player of the Year, two semifinalists of last year's World Magic Cup, and three members of the current Top 25, just among the eight players who did best on Day 1! So the stage for Day 2 was set, populated with lots a familiar characters, with the above and many more, with Pirates, Dinosaurs, Vampires, and Merfolk, with drafts to navigate and treasure to claim. Check back tomorrow for more insight into Rivals of Ixalan Limited, for results straight from the battlefield, and for the conclusion of Grand Prix London 2018!